In 2009, CEDAW was the first UN treaty body to include intersex in Concluding Observations (though not IGM). 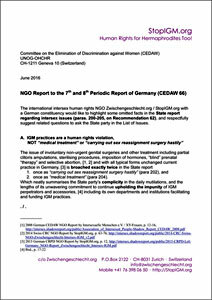 Germany now mentioned intersex in their follow-up report, to which this NGO report for the List of Issues (LoI) to be formulated during the Committee's Pre-Sessional Working Group (25 Jul 2016 - 29 Jul 2016) relates. • The Concluding Observations for Germany, hopefully with another severe reprimand for IGM practices, are due at the end the 66th Session (03 March 2017).